I started playing the guitar when I was 12 years old. I was originally drawn to the instrument by the rock bands of the early 90s. As soon as I started playing it became my passion and I wanted to spend as much time as possible with the guitar. A few years later I began taking lessons with Vincent Bredice, who introduced me to jazz and classical guitar. 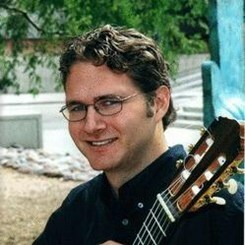 In college and grad school my focus was on classical guitar, and I was extremely fortunate to have the opportunity to travel throughout the U.S. and Europe to study with some of the most sought-after teachers in the world. I earned my bachelor’s and master’s degree in guitar performance from the University of Arizona, where I studied with Tom Patterson. In 2004, I was granted a Fulbright scholarship to spend a year studying at the Franz Liszt Hochschule in Weimar, Germany. During my time there, I had lessons with Monika Rost and Thomas Müller-Pering. I received my doctorate from Indiana University’s Jacobs School of Music in December 2013, majoring in guitar performance and minoring in music education and jazz studies. I've been living in South Jersey for about five years now. In addition to teaching at Music and Arts, I also teach classical guitar at St. Joseph's University in Philadelphia. I enjoy teaching all styles of guitar playing, and I have students who excel in blues/rock, jazz, and classical styles. I always strive to balance the development of technique and a foundation in music fundamentals with musical selections that students enjoy playing. Request Lessons with Cale today!